The North Shore area has a long history of dog sledding.John Beargrease was a legendary Anishinaabe figure who delivered mail up and down the shore by dog sled in the winter and small boat in the summer. 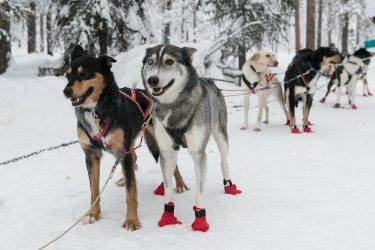 Named in his honor, the John Beargrease Sled Dog Marathon is the largest dog sled race in the lower 48 states, attracting teams from all over the world. Additional local races include the Gichigami Express and Gunflint Mail Run. Numerous local mushers participate in these local races as well as the famous Iditarod in Alaska. Many local mushers offer dog sled adventures. These can range from short local rides up to multi-day excursions deep into the wilderness. Ice fishing on a remote wilderness lake, accessible only by snowshoe or dog sled, is a once-in-a-lifetime "bucket list" item for many people.